Treatment of hair loss depends upon finding the cause and treating it. It is not as simple as it sounds, though! Proper diagnosis, as was discussed earlier depends upon detailed history, clinical examination including hair pull test and trichoscopy and relevant lab investigations. Once these are done, we are ready to deal with the enigma of hair loss or alopecia! The first step would be to differentiate scarring from non-scarring alopecia. How to Differentiate Scarring from Non-Scarring Hair Loss? Close examination of the skin is enough to differentiate the scarring from non scarring alopecia. 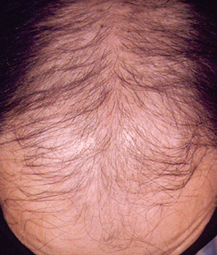 In scarring alopecia, there is absence of hair follicle opening and increased wrinkling of the involved skin. The skin surface is thin, shiny and dry. Underlying small blood vessels may be visible through the atrophic skin. Towards the periphery of the bald patch, hairs will be twisted because of the pull of the scar tissue. Treatment of common baldness could be medical or surgical. Medical Treatment of common baldness: Topical Minoxidil is THE treatment for baldness. Most so called herbal and other miraculous cures are ineffective, or a concoction containing minoxidil itself. Finasteride is an oral medication used for extensive male pattern baldness. It works by binding the enzyme which converts free testosterone to Dehydrotestosterone (DHT). This is a prescription medication and should only be used under the supervision of a dermatologist. Irritation and allergic contact dermatitis may occur to the application. Platelet Rich Plasma injections and Mesotherapy with hairtonics and vitamins are becoming increasingly popular in treatment of hairloss including common baldness. Before contemplating surgery like hair transplantation, the subsequent risks and cost of such surgeries should be considered. In milder cases, a change of hair style or later, a wig would suffice. Flap and strip grafts, scalp reduction operations are also available as alternatives to hair transplantation . Hair weaving is a new technique that is gaining popularity. Hair fall is common after delivery or after a prolonged illness, take nutritious food and use mild shampoos. Vitamin supplements are beneficial, especially biotin and zinc containing vitamins help hair growth. Check haemoglobin level for anaemia, and, if present, correct it. Rule out thyroid and other endocrinological causes. Learn to manage stress properly, here is an appropriate program which gives a practical program to manage your stress for life. Recurrent Patchy Hair Loss (Alopecia Areata) is the commonest type of localized hair loss : Learn more about alopecia areata. The information given in this article is for educational purpose only so that patients are aware of the options available. No diagnosis should be made or treatment undertaken without first consulting your doctor. If you do so, the author or the website will not be responsible for any consequences. The images provided are for illustration purpose only and are copyrighted.